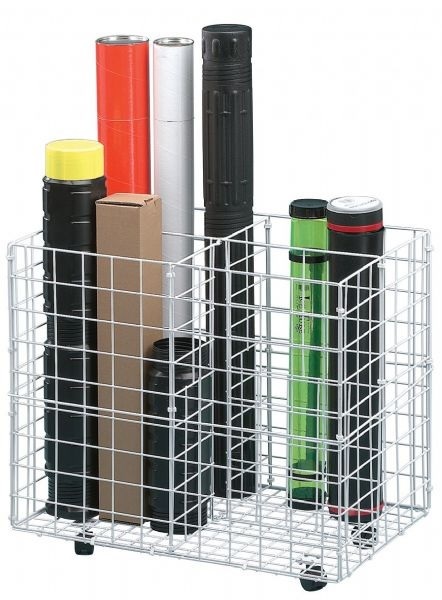 King Size Wire Bin Blueprint Drawing Storage - Offers extra storage space conveniently along side reference table or desk. Designed with 4 equally divided compartments for quick access to rolled drawings, maps, charts, mailing tubes, posters and more. Constructed of white plastic-coated heavy-gauge wire with bottom dust protection and 4 dual wheel swivel casters. Overall dimensions: 26"h x 28"w x 18"d. Shipped K/D with illustrated assembly instructions. Shipping weight 15 lbs.